Posts Selected From the Category "Basic Instrumentation"
Like other inductive transducers, this transducer is also used for converting a linear motion into an electrical signal. The basic construction of an LVDT is explained and shown in the figure below. The device consists of a primary winding (P) and two secondary windings named S1 and S2. Both of them are wound on one cylindrical former, side by side, and they have equal number of turns. Their arrangement is such that they maintain symmetry with either side of the primary winding (P). A movable soft iron core is placed parallel to the axis of the cylindrical former. An arm is connected to the other end of the soft iron core and it moves according to the displacement produced. As shown in the figure above, an ac voltage with a frequency between (50-400) Hz is supplied to the primary winding. Thus, two voltages VS1 and VS2 are obtained at the two secondary windings S1 and S2 respectively. The output voltage will be the difference between the two voltages (VS1-VS2) as they are combined in series. Let us consider three different positions of the soft iron core inside the former. Null Position – This is also called the central position as the soft iron core will remain in the exact center of the former. Thus the linking magnetic flux produced in the two secondary windings will be equal. The voltage induced because of them will also be equal. Thus the resulting voltage VS1-VS2 = 0. Right of Null Position – In this position, the linking flux at the winding S2 has a value more than the linking flux at the winding S1. Thus, the resulting voltage VS1-VS2 will be in phase with VS2. Left of Null Position – In this position, the linking flux at the winding S2 has a value less than the linking flux at the winding S1. Thus, the resulting voltage VS1-VS2 will be in phase with VS1. From the working it is clear that the difference in voltage, VS1-VS2 will depend on the right or left shift of the core from the null position. Also, the resulting voltage is in phase with the primary winding voltage for the change of the arm in one direction, and is 180 degrees out of phase for the change of the arm position in the other direction. The magnitude and displacement can be easily calculated or plotted by calculating the magnitude and phase of the resulting voltage. The graph above shows the plot between the resulting voltage or voltage difference and displacement. The graph clearly shows that a linear function is obtained between the output voltage and core movement from the null position within a limited range of 4 millimeter. The displacement can be calculated from the magnitude of the output voltage. The output voltage is also displayed on a CRO or stored in a recorder. 1. Maintains a linear relationship between the voltage difference output and displacement from each position of the core for a displacement of about 4 millimeter. 2. Produces a high resolution of more than 10 millimeter. 3.Produces a high sensitivity of more than 40 volts/millimeter. 4. Small in size and weighs less. It is rugged in design and can also be assigned easily. 5. Produces low hysteresis and thus has easy repeatability. 1. The whole circuit is to be shielded as the accuracy can be affetced by external magnetic field. 2. The displacement may produce vibrations which may affect the performance of the device. 3. Produces output with less power. 4. The efficiency of the device is easily affected by temperature. An increase in temperature causes a phase shift. This can be decreased to a certain extent by placing a capacitor across either one of the secondary windings. 5. A demodulator will be needed to obtain a d.c output. This type of transducer is used for finding the linear displacement in terms of voltage or other digital parameters. 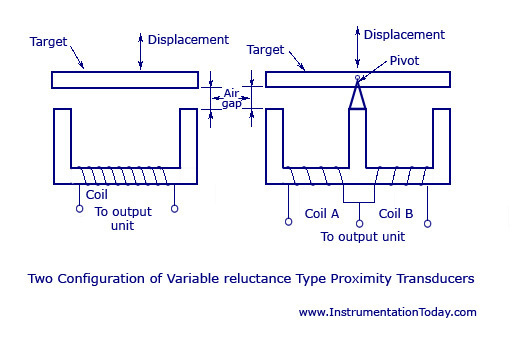 Another transducer for finding the linear displacement is the Linear Motion Variable Inductance Transducer. This transducer consists of a primary and secondary coil. The constructional diagram of the transducer is shown below. An ac source is given to the primary. This ac source excites the primary and a flux is produced. This flux is linked to the secondary coil and thus a voltage ‘V’ is induced. If the mutual inductance between the primary and secondary windings is represented by ‘M’ (Hertz) and the frequency of ac excitation is represented by ‘w’, then the voltage ‘V’ developed in secondary coil can be written as V = MwIp. Ip – The current due to excitation in primary (Amperes). 1. The device is small when compared to other transducers. 2. Wear and tear is minimized as there is no physical contact between the target and coil configuration. 3. The output value will be accurate for small displacements as there is a linear relation between the output voltage and linear displacement. 4. There will not be any external effects by contamination. 5. The device works accurately even at higher temperatures up to 400 degree Celsius. 1. The accuracy decreases when it comes to the measure of large displacement. This is because the linear relation between voltage and displacement is less at higher ranges. 2. The external magnetic field may cause harm to the ferromagnetic material. This device can be set up in two ways. Both the diagrams are shown below. The device consists of a coil that is wound on a core made up of ferromagnetic material. The displacement is given to the core through a target that makes an upward and downward movement according to the displacement produced. It does not touch the core of the coil and a smaller air gap is made between them. When the target moves closer to the coil due to the displacement, the air gap becomes less causing the reluctance of the magnetic field to reduce and thus the coil inductance to increase. The value of inductance keeps on varying according to the variation in target movement. A CRO or a recorder takes these values and displays it to the user. In the right side figure shown above, an E-type core is used for finding the displacement. The target is also pivoted at the central limb of the core. Thus, a single coil is divided into two turns and the end of each coil works as the arms of an inductance bridge. As the displacement value changes, an output signal is produced. This is given to a CRO after amplification. The biggest advantage of this device is that it shows a linear relationship between the output and the displacement. In order to avoid confusion and to obtain a consistent result, a set of units and standards have been commonly followed by all countries. Each instrument used is given a separate symbol which makes it easier for its identification and also for process control drawings. All the lists have been developed by The Instrument Society of America (ISA) and is being used worldwide. The units that are used for the measurement f different variables fall mainly under two categories. One is the International system, SI (Systéme International D’Unités) and the other is the English system. The problem is that the latter is followed by very few countries including USA, but the former is followed by most of the other countries. There are some parameters that are to be checked during a process. They are all explained below. Accuracy – It is defined as the difference between the indicated value and the actual value. The actual value may be a known standard and accuracy is obtained by comparing it with the obtained value. If the difference is small accuracy is high and vice versa. Accuracy depends on several other parameters like hysteresis, linearity, sensitivity, offset, drift and so on. It is usually expressed as a percentage of span, percentage of reading or even absolute value. The standard value is set by the government so as to maintain the standard. Reading accuracy is the deviation from true at the point the reading is being taken and is expressed as a percentage. Absolute accuracy of an instrument is the deviation from true as a number not as a percentage. Span – It can be defined as the range of an instrument from the minimum to maximum scale value. In the case of a thermometer, its scale goes from −40°C to 100°C. Thus its span is 140°C. As said before accuracy is defined as a percentage of span. It is actually a deviation from true expressed as a percentage of the span. Precision – It may be defined as the limits within which a signal can be read. For example if you consider an analog scale, which is set to graduate in divisions of 0.2 psi, the position of the needle of the instrument could be estimated to be within 0.02 psi. Thus the precision of the instrument is 0.02 psi. Range – It can be defined as the measure of the instrument between the lowest and highest readings it can measure. A thermometer has a scale from −40°C to 100°C. Thus the range varies from −40°C to 100°C. Reproducibility – It can be defined as the ability of an instrument to produce the same output repeatedly after reading the same input repeatedly, under the same conditions. Sensitivity – It can also be called as the transfer function of a process. It is the ratio between the change in the output of an instrument to the corresponding change in the measured variable. For a good instrument or process, the sensitivity should always be high, thus producing higher output amplitudes. Offset – Offset is the reading of an instrument with zero input. Drift – Drift is the change in the reading of an instrument of a fixed variable with time. Hysteresis – It can be defined as the different readings taken down when an instrument approaches a signal from opposite directions. That is the corresponding value taken down as the instrument moves from zero to midscale will be different from that between the midscale and full scale reading. The reason is the appearance of stresses inside the instrument material due to the change of its original shape between the zero reading and the full scale reading. Resolution – It is the smallest difference in a variable to which the instrument will respond. Repeatability – It is a measure of the closeness of agreement between a number of readings (10 to 12) taken consecutively of a variable, before the variable has time to change. The average reading is calculated and the spread in the value of the readings taken. Linearity – It can b defined as a measure of the proportionality between the actual values of a variable being measured to the output of the instrument over its operating range. The basic need of instrumentation in a process is to get the best and most amount of information so as to successfully complete the process. When referring to the completion of the project with reference to instrumentation, it basically means maximum efficiency with minimum production expense and desired output quality. The information that is achieved from these processes may be very simple and may mostly involve a direct measurement method. But as the process becomes more complex, direct measurement may seem to be impracticable and so indirect methods must be used for measurements. These methods involve a derived relationship between the measured quantity and the result that is needed. Most of the indirect methods involve electrical techniques as they have high speed and also simple processing methods. The output from such methods is easier to link to computers. The obtained information may not necessarily be the direct value of a measured quantity. That is, the value obtained may be a variation of the value with respect to other parameters. It may also be a signal corresponding to the end limit. It could also be a specific value with an indicating hand over a suitable scale. Thus, one instrument may be needed to perform the required operations individually or a number of them at a time. Flow trough variables can be measured from a single point in space. Some of the most measured variables using this method are force, momentum, flow, charge, current, volume and so on. Trans-variables need a referencing point and a measuring point. Some of the measured variables are displacement, velocity, pressure, temperature, level and voltage. If we are mentioning instrumentation systems based on industrial applications it can be broadly classified into two. They are automatic type and manual type. The former works automatically without any help and the latter will need the assistance of an operator. If viewed from the system design view, the instruments will be classified into self-operated type and power operated type. Whatever maybe the performance of an instrument, there will be some basic building blocks for its functioning. The correct combination of these blocks in a measurement system helps in converting a process condition into a suitable indication. These blocks are also called as functional units and are present in all instrumentation systems. The block diagram is shown below. The input receives the quantity whose value is to be measured and is converted into its proportional incremental electrical signal such as voltage, current, resistance change, inductance or even capacitance. Thus, the changed variable contains the information of the measured variable. Such a functional element or device is called a transducer. The output of the transducer is provided to the input of the signal processing unit. This unit amplifies the weak transducer output and is filtered and modified to a form that is acceptable by the output unit. Thus this unit may have devices like: amplifiers, filters, analog to digital converters, and so on. The output from the signal processing unit is fed to the input of the output unit. The output unit measures the signal and indicates the value to the reader. The indication may be either through: an indicating instrument, a CRO, digital computer, and so on. All the functional units that were used in an analog system will also be used here. He basic operation in a digital system includes the handling of analog signals, making the measurements, converting and handling digital data, programming and also control. The block diagram and functional units are given below. All the physical input parameters like temperature, pressure, displacement, velocity, acceleration and so on will be converted into its proportionate electrical signal. This working of this unit is exactly the same as that of a signal processing unit in an analog instrumentation system. It includes all the balancing circuits ad calibrating elements along with it. Multiple analog signals are received by this device and are sequentially provided on to a measuring instrument. It is used to convert an analog signal to a form that is acceptable by the analog to digital converter. The analog signal is converted into its proportional digital signal. The output of an A-D converter is given to a digital display. All the system programming and digital data processing functions are carried out by this unit. The auxiliary equipment may be a single computer or may be a collection of individual instruments. Some of its basic functions include linearizing and limit comparison. It is mostly a CRO or a computer.